The Perfect Barbeque Everytime. Our Top 5 Barbeque Tips. What’s more delicious than freshly cooked barbequed meat? Let’s get fired up! Morelands Grill offers the ultimate steakhouse experience and our chefs are offering up some of the secrets needed for the perfect barbecue this summer. Tasty. Juicy. Hot off the Josper Grill. Our Himalayan salt aged Irish beef is seared to perfection. Just add hand-cut Rooster chips, pepper sauce & a chilled glass of Sauvignon Blanc… Bliss! With a menu featuring premium Fillet Steak, Dexter Beef Burger and Milk-fed Veal Chop, the intense heat of our Josper Grill creates a natural seal that locks in the flavour of the meat. First things first… The meat. Here at Morelands Grill, we source our prime cuts of 30-day Himalayan salt dry aged Irish beef from well-known butcher Pat McLoughlin. Ask your butcher for fillet, rib eye or striploin steak. Or choose lamb or pork chops. Quality is your main ingredient; go with your butcher’s recommendation. Homemade burgers are best and so easy to make. All you need is salt, pepper and good minced beef. Add classic Bearnaise sauce and sandwich in a warm crusty white roll. When it comes to seasoning, anything goes. Fancy Cajun? Or Mediterranean? Try olive oil, salt, lemon, herbs & spice for a simple rub. This helps to tenderise and flavour the meat. Or go for a tasty marinade. Teriyaki and Jerk are best paired with chicken, while a Whiskey Glaze will seriously up your steak game. Soak your meat overnight to mop up the flavour. Michael Liu, Chef at Morelands Grill, loves to barbeque Spicy Lamb Skewers. Marinade in sesame oil, soy sauce and spices, then thread with mixed pepper and onion. Just add heat! Cooking for vegetarian friends? Barbeque is not just for meat-lovers! Tuck in to grilled halloumi skewers, corn on the cob, blackened sweet potato & seared stuffed peppers. Nothing tastes better than freshly griddled vegetables. And the charred stripes look great! Get creative with sides, too. All kinds of ‘slaw, creamy potato salad & colourful cous cous. Boille Irish goat’s cheese is a favourite of our Executive Chef, John Hickey. Try it melted over grilled polenta or portobello mushroom. Pair with some fiery rocket and fresh tomato salsa! A chef is only as good as his tools. Half the fun of barbequing is buying the kit! A sturdy oven glove & tongs are barbeque must-haves. Have everything ready, before you start. A brush for your marinade is vital when it comes to packing flavour. Coat your meat generously to allow for plenty of overnight soakage. Add more while cooking, to caramelise. Heat is the name of the game! Your barbeque should be red hot. Pack the charcoal together for intense, direct heat. Don’t forget to put a lid on it to trap all of that smoky goodness. Add coal regularly to keep the grill burning hot & spread around for even temperature. Try adding wood chips for extra smoky flavour. Once the flames die down, you’re ready to go. Timing is key; make sure your meat is cooked through, but not cremated! Add more marinade during cooking to seal in moisture and ensure to rest the meat before serving. Book a table at Morelands Grill. Clarify the butter by melting it in a small, heavy-based saucepan over a low heat. When the butter is foaming, remove the pan from the heat and leave it to stand for a few minutes so that the white solids sink to the bottom of the pan. Sieve the butter through a fine sieve and discard the solids. Pour the vinegar into a non-reactive saucepan. Add the shallots, chopped tarragon and salt, to taste. Heat gently over a medium heat until the volume of liquid has reduced by more than half. Strain and set aside until completely cooled. Lightly beat egg yolks with one teaspoon of water. Stir the egg yolk mixture into the cooled vinegar, then add the lemon juice. Pour the mixture into a bowl suspended over a pan of simmering water (do not allow base of the bowl to touch the water). Whisk constantly until the sauce has thickened enough to coat the back of a spoon and has increased in volume. Remove the bowl from the heat and slowly pour in the clarified butter in a steady stream, whisking continuously, until the mixture is thick and smooth. Fold in the tarragon leaves and season to taste, with salt and freshly ground black pepper. If wine is your preferred tipple of choice when eating out, we are sure you will agree that it is a beverage built for food, which can add a texture and richness to it. There are certain elements you need to get right to elevate your wine choice from being a good one to a great one. To give you a crash course in what you need to consider: when it comes to wine, you are focusing on its properties in terms of acidity and tannins. When it comes to your dish of choice, you are looking to match the wine’s properties with the salt and fat components of the food. While there is no wine that goes with everything, we are firm believers that there is a wine for every dish. With that in mind, we have compiled a short guide to some food and wine pairings that you might like to consider when you dine with us at Morelands Grill. 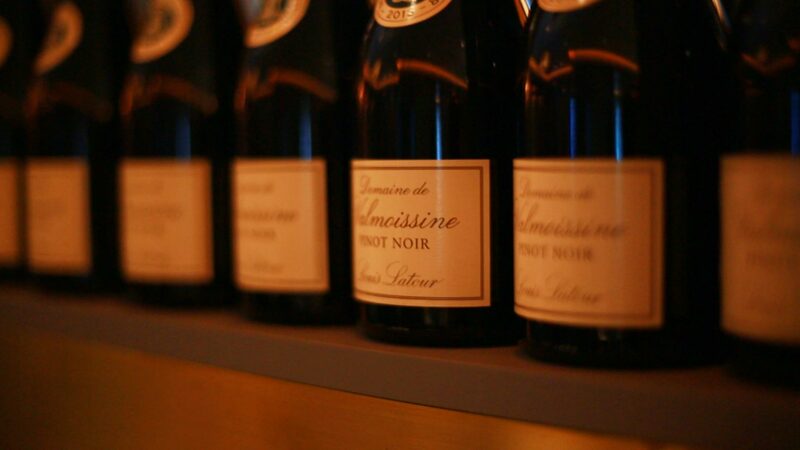 If you decide to order the Grilled Organic Clare Island Salmon, with champ, grilled asparagus, tomato and brown shrimp cream sauce, then we would recommend you pushing the boat out a bit and trying the Louis Latour, Domaine de Valmoissine, Pinot Noir. Now, that might sound like we are breaking the traditional rule of fish with white wine, but hear us out. Wines with low-tannins that are light and juicy, like this pinot noir, work nicely with a relatively meaty fish like fresh salmon. The richness of the salmon is complemented by the acidity of pinot noir, with the grilling process accentuating the oakiness of the wine. If the Risotto of Wild Irish Lobster, with seared king scallops, sea rosemary and Parmesan catches your eye, then you must try the Cakebread, Chardonnay, California, a silky new world white wine which is delicious with shellfish. Both elements share buttery flavours, a rich, creamy texture and good intensity of flavour. The acid in the wine helps enhance the sweetness of the lobster and scallops, while also cleansing the palate. To match the intensity of flavour of our 30-days Himalayan Salt-aged Rib-Eye Steak, we would suggest the equally intense Morgan Bay, Zinfandel, 2013, Napa Valley. Zinfandel is one of the few wines that can handle a good, old-fashioned smoky, intense barbecue. The sweetly fruited flavours of a big Zinfandel, like Morgan Bay, are a natural complement to barbecued meats. We would be remiss not to mention the 15 Champagne and Prosecco options on the menu. Sparkling wine is so versatile with food. A Brut Champagne like our Taittinger Brut Réserve NV has a touch of sweetness, which makes it extra-refreshing when served with salty foods, like our Morelands Crab Cakes. And last but certainly not least on the suggestions list is our recommendation to try a Rosé — people tend to assume that it’s only for summer drinking, but it is truly versatile year-round. A Rosé, like our Casa Roja Rosado Rosé Garnacha, 2015, Spain makes an excellent accompaniment to richer dishes, like our Morelands House Made Spatzli. The Garnacha grape is generally a spicy, berry-flavoured variety that is soft on the palate. Light in colour, this Casa Roja Rosé makes for a fresh and fruity glass of vino, with its delicate nuances of redcurrant and raspberry. Make sure to drop us a line, and share a photo via Instagram to let us know how you get on with our recommendations! You can tag us @MorelandsGrill. At Morelands Grill we firmly believe that your food’s journey from producer to plate should be a short one. Our menus champion the best of locally sourced high-quality seasonal ingredients. We’d like to introduce you to some of the award-winning Irish food producers and suppliers that we are delighted to work with – you’ll have the pleasure of sampling their fare when you visit to dine with us. Dublin’s famous Bretzel Bakery supplies us with our bread, including gluten-free options. The Bakery was founded in 1870 in Portobello, and continues to use artisan methods in the preparation of its breads, scones and pastries. Bretzel is a member of the Real Bread Ireland group, a network of craft bakers who promote great baking and real bread. And what exactly is real bread, you ask? Well, it is bread made from flour, water and fermentation. No additives or preservatives are included. In other words, it’s the good stuff. Now in its 3rd generation, McLouglins have put the relationship between farmer and customer to the forefront since 1965 and we are delighted to work with them as they source Peter Hannan’s 30-day Himalayan salt aged Irish beef. McLoughlins provide the top restaurants in the country with premium meats. It is no mean feat that they count Michelin Stars among the restaurants they supply! Customer satisfaction remains paramount to this family craft butchers and this results in excellent meats, where the taste tells its own tale! Peter Hannan, set up his multi-award-winning company in 1991 and has won numerous awards for their system of dry-aging meat in a specially designed cold chamber. The chamber comprises of a 12ft wall of 1,000 hand–cut Himalayan rock salt bricks. The salt is known for its exceptional flavour-enhancing qualities. The dry-aging process takes place over a period of 28–45 days, which concentrates the flavour of the meat, and seals in the natural juices. All our meat dishes are prepared on our Josper Grill – read more about the process here to whet your appetite for how we cook our premium beef dishes. The restaurant’s fish supplier is Wrights of Marino, a family business with over 110 years of hands-on experience and knowledge in selling fish. Wrights source their fish from local fishing ports whose boats use sustainable and responsible fishing methods. They deliver fresh fish to our restaurant six days a week. You will have a multitude of seafood menu options at Morelands Grill. For lunch, you can choose between the Josper Baked Crevettes, Morelands Crab Cakes, Lobster Roll or Morelands Traditional Fish and Chips (with Sole fillets). If you are paying us a visit at dinner time, you can choose between the Risotto of Wild Irish Lobster, Josper Grilled Crevettes, or Lobster Bisque for your appetiser. For mains, you can opt for the Grilled Organic Clare Island Salmon, Morelands House Made Spatzli with native Irish lobster, prawns and fresh crab. You also have a side-dish option of buttered prawns or seared scallops with your Josper-grilled meat. Morelands Signature Sundae includes premium ice cream produced by the Taylor Family on the Glastry Farm in Co Down. They have been farming dairy cows since 1856. Their diversification into ice cream production is relatively recent, beginning in 2007, but they have already won several quality awards for it. The milk used in their ice cream comes from the Taylors’ own pedigree herd. Like the Bretzel Bakery, you won’t find any artificial additives, artificial stabilisers or artificial ingredients in the Glastry Farm range. 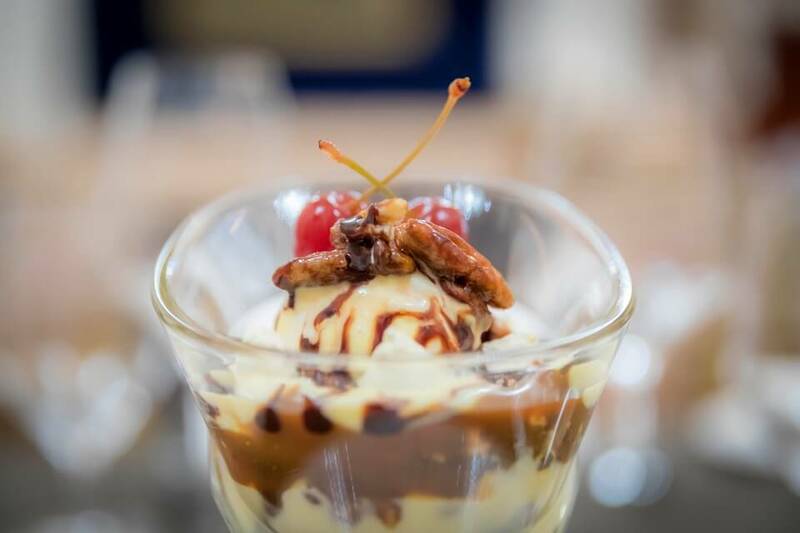 The ice cream we use in the Morelands Sundae is Glastry Farm’s Yellowman Honeycomb, a rich handmade ice cream, which won Double Gold in the 2012 Great Taste Awards. Yellowman Honeycomb ice-cream is also suitable for vegetarian diets. Now that you have been given a flavour of some of our top-quality ingredients at our locally sourced restaurant, why not book in a visit to Morelands Grill to try them first-hand? In the heart of Dublin City. Morelands Grill is only a stone’s throw from Trinity College Dublin, adjacent to Temple Bar and a whole host of hotspots including some of Dublin’s best bars, restaurants and clubs. In that sea of dining options, the question for us was: how do we make sure that we stand out from the crowd? The answer, as it turns out, was simple – invest in a Josper Grill. Our Dublin 2 eatery decided that the best way to instil a moreish taste in the menu was to install this state-of-the-art grill in our kitchen. It was first created in 1970 by restaurateurs and chefs Josep Armangue and Pere Juli as a combination grill and oven for their own restaurant in Spain. These days, its reputation for producing flavoursome and mouth-watering dishes precedes it, and so the Josper Grill – which gets its name from its creators – can be found in restaurants the world over. Cooked at temperatures of up to 500 degrees, perfectly seared, cooked to perfection. So, the tools of the trade are top-notch, what about the ingredients? In terms of its beef offerings, our menu follows a time-honoured line of choice – fillet, rib eye and striploin steak. The beef is sourced from a small group of farmers in the South Leinster region. Their livestock is reared on lush, green grass – which Ireland thankfully has in abundance – and grains. No artificial growth promoters or additives are used. Already a firm favourite on our menu is the 10oz Rib Eye Steak, which is a salt-aged Irish beef by Peter Hannan of Hannan Meats. Using a cold chamber lined with blocks of Himalayan Salt, the beef is dry-aged for 30 days. This process has already won his company numerous awards for producing wonderfully flavoursome meat. When it comes to what sauce to serve on the side, you can opt for the traditional accompaniment to steak, Green Peppercorn and Brandy sauce, a richer Béarnaise option, a classic French Bordelaise, or a Prawn Butter sauce. For those who have a combined craving for seafood and meat, you can also order some buttered prawns or seared scallops. Our seafood, like our beef, is sourced locally. So, in a nutshell, what can we guarantee you in the ultimate steak experience at Morelands Grill? Prime grade Irish beef, aged to perfection, and cooked on the best grill in town to give you the best steak in Dublin! Why not book a table and come taste it for yourself if you don’t believe us.